I’m so happy and excited to feature you, ER Arroyo, on BOD’s author spotlight interview. Especially in light of your recent release of Sovereign as an audiobook. I listen to audiobooks all the time. They are one of my favorite ways to become immersed in a story, so I can’t wait to learn about the process from book to audiobook. 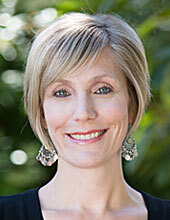 And I’m also excited to introduce narrator, Corinne Bupp. Thank you both for joining us, and for sharing your talents with us. Corinne: Glad to be here! First off, ER, can you tell us a little bit about Sovereign? ER: Of course. Sovereign was my debut novel. It’s a young adult dystopian/post-apocalyptic book that features a teenage girl named Cori. She’s trapped in a rigidly controlled colony of survivors and wants out, but she isn’t sure what could be out there. She’s been taught that the world was obliterated by warfare and the only people on the outside are savages. 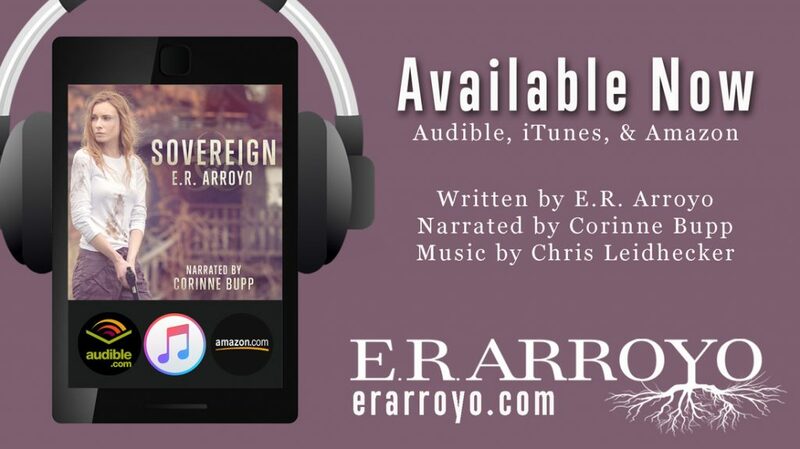 When did you decide that Sovereign should become an audio story? ER: Honestly, just from seeing some BOD authors discussing audiobooks. It piqued my interest so I did a little digging. I didn’t know it was as accessible as it turned out to be. I’m so glad I went for it! What was the process of making this happen, and what were some of the challenges to accomplishing this goal? ER: It started with creating an account and opening up the book for auditions. I received, I think, around 30 auditions and nothing was really working for me. Then I came across Corinne and asked her to audition. I loved her audition and something about her voice just felt right, so we signed contracts within a couple of days. I would say the biggest challenge we faced was the timeline of completing the project. We had a 60-day deadline and got a little behind right at the start. There’s surprisingly a lot of back and forth between author and narrator before it is finished. In short, it’s a lot of work! Especially for Corinne. How did you go about choosing a narrator? What was the process for even deciding who to audition? ER: Basically, I listed my project on a site called ACX and then opened up for auditions. My project page included a brief script and an explanation of what I was looking for from the character. Narrators came to me, for the most part. I did search the site myself as well and I wrote a few people asking them to audition based on samples they had up from other auditions. Ultimately, what made you choose Corinne to represent the voice of Cori? ER: Lots of things, but basically it came down to her tone. I could tell from her audition that she would be able to voice Cori just right—not high-pitched, not too feminine, not too proper. Are there any plans for making The Offering into an audiobook? Can you tell us about any other writing projects you’re working on? Yes! I will be in an anthology called The Doomsday Chronicles coming out on February 19th. Aside from that, finishing up a couple short stories that are prequels to Sovereign will be my priority. After that, I think it’s time for a new novel. Thank you, ER. I can’t wait to experience Sovereign again in audio. Now, Corinne Bupp, how fun to be a narrator! I have always wanted to narrate books, but my voice is way too whiny when recorded. So, I’m going to live vicariously through you. Can you tell us about your background and how you got started in narrating? Corinne: Yeah! My background and degree is in musical theatre but it has been a dream of mine to work on an audiobook since 2009. While I was in college, I started working privately with a voice and speech professor with the sole goal of doing an audiobook. Since then I have been primarily performing onstage and not actively pursuing voice over. It wasn’t until this year, when I auditioned for E.R., that I really started to make that dream a reality. Is it hard getting into character? How do you do it? Corinne: I love it. Most of it is intuition, analysis of the story, and the author’s tone. E.R. and I actually worked together a lot on the characters. We met and talked about other characters and actors that the characters of Sovereign were similar to or even sounded like. What was it like working with ER? How did you feel when you discovered that the main character of Sovereign shared your name? Corinne: I may have freaked out a little bit. I already get really excited when I meet another Corinne – especially spelled the same! Honestly, it made me want to be a part of the project even more. It just felt meant to be! What was it that made you connect most with Cori? Corinne: Most of the way she handles her relationships felt very familiar. I think we can all relate to protecting ourselves by putting up walls, just not with such severity. That being said, her closeness to her father was probably my strongest connection to Cori. What was your favorite part of working on this project? 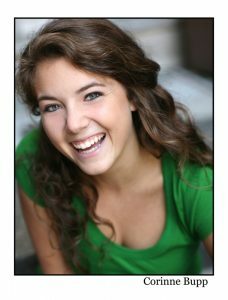 Corinne: My favorite part of this project was definitely the character study. I just thoroughly enjoyed “being” Cori. Can you tell us about any other narrating plans you might be involved in? Corinne: E.R. and I are in talks for The Offering in the coming year! I’m very excited! Oh, that’s exciting. Both of you will have to keep all of us at BOD updated. Thanks again, ER and Corinne, for spending time with us. Congratulations to you both! Happy New Year to all our BOD members! What a fantastic year we’ve had. I’m sure the next year will prove to be even better. As a way to celebrate this awesome group, I thought it would be fun to let everyone get to know how it all started. So please welcome Author ER Arroyo and Cheer Papworth! Thank you so much ER and Cheer for bringing us all together. We so appreciate all you do. Will you two tell us how your friendship started, and where you came up with the amazing idea to start BOD? What did you have to do to make it all work? ER: Well, this might be a long answer! 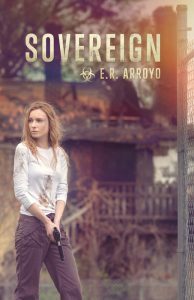 Cheer came across my debut novel, Sovereign, in a Goodreads giveaway and she ended up picking up the e-book and reviewing it. I can’t really remember who initiated contact with whom. At some point, she had reached out to me to let me know I had been nominated in a monthly book club which got a dialogue going between us. Her passion for getting the word out about my books was kind of magnetic so I asked her to help me start a street team. A couple months after that, I approached her about starting Band of Dystopian. 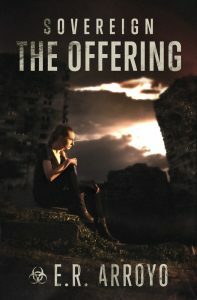 The idea for Band of Dystopian actually came about when I was promoting my second novel, The Offering. A good friend of mine (a book publicist) had told me to find a dystopian Facebook group. At the time, I couldn’t find a single one. I knew there had to be other authors like me, because I KNEW there were plenty of dystopian books out there waiting to be discovered and talked about. I needed to find my tribe, a home for authors and fans of the kinds of books that I love. Since it didn’t exist yet, Cheer and I created it. Cheer: I feel like I have known ER for a long time, but in reality we have never met in person or even so much as had a conversation over the phone (gasp). But as ER said, we did in fact meet on Goodreads. This may be shocking to some of you, but I am always on the lookout for a great dystopian read and when I stumbled upon Sovereign I was intrigued by the blurb and immediately purchased the book and read it in one sitting. I eventually became a moderator for the Goodreads group YA Apocalyptic and Dystopian Fiction, my primary responsibility being Book of the Month. Sovereign was nominated for BOTM and I desperately wanted it to win, so I sent her a message to make sure she was aware of the nomination and that was the beginning of an ongoing dialogue that led to friendship. When ER asked me to join her in creating BOD, I was thrilled. We jumped in with both feet and we are having a fantastic time. BOD has grown so much over the last six months. Did you guys know this group could become what it is? What kind of goals or vision do you have for BOD, and are those goals being met? ER: My goals, expectations, hopes – whatever – have been far exceeded. This whole endeavor has been one of those where you cross your fingers, squint your eyes at the screen, and just hope something happens. And fortunately for us, something did. The most important thing to me is that people LOVE this group. They have a good time, they feel safe talking about the stuff they love (with no one judging them), they have made friends, and they have discovered books and authors they really love. Cheer: I know this sounds crazy, but within a few days of ER asking me to help her start BOD, we were up and running. 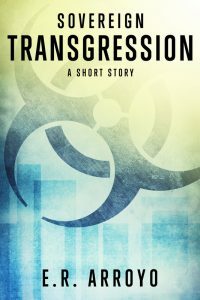 Our only goal was to help connect fans and authors of dystopian fiction, as well as create a friendly place for people like us to interact and share. We didn’t really have a clear vision or goals; we were just flying by the seat of our pants. We sort of faked it and figured it out as we went along. With that being said, ER is the consummate professional and I have some marketing experience. So we aren’t total amateurs, but the truth is we somehow muddled through it and managed to get it right. Since this groups is all about authors finding readers, and readers finding authors can you tell us how you fit into either category? Cheer: I’m an avid reader and I’ll pretty much read anything and everything. As a child, my grandmother had a beautiful set of the classics, bound in leather and untouchable. I would sneak those books off of her shelf and stay up all night reading and then return them during the early morning hours. I discovered Treasure Island, The Odyssey, and my favorite, Pride and Prejudice. I eventually got caught and was handed a box of The Bobbsey Twin Mysteries and Nancy Drew, which I enjoyed, but I longed for the big girl books. Lucky for me, the library kept me well supplied and happy. ER, I have read all of your books. I love the world you have created in the Sovereign Series. When did you start writing these books? What did you do before you wrote, and how have your other responsibilities helped you with your creative process? Are you currently writing something, and if so, can you give us a snippet of what we can expect? ER: So the motherhood thing… yeah that’s for real. I am about a hundred times slower at churning out material. BUT like I said earlier, I am working on two short stories to complete the Sovereign Series. One is from the perspective of a Book 1 fan favorite, Titus. The middle story is from the POV of someone who might know a little something about another fan favorite, who will remain nameless for now. A snippet? Here’s a little excerpt from my WIP (not the Titus one). Today feels special somehow. That’s how I know I need to make sure and bring my gun. When I get a funny feeling, that little uneasiness in my belly, that’s how I know – danger’s coming. While I’ve learned to expect it, I haven’t yet figured out how to avoid it, and this is no different. So I pluck a loaded clip from my suitcase before I lock the case and stash it in the top of the closet. See, it’s never really what you think when you first get into a serious situation. Any situation really. You find yourself standing on the outside looking in and you figure, if that were me I’d do it different – do it better. Then you get involved and before you know it, you’re in too deep and you can’t go back. Cheer: Where the heck is the Titus story? Cheer: Wait, can I ask ER a question? Cheer: ER, do you have an idea for a new series after the Sovereign Series is complete? Will you continue to write dystopia or possibly try another genre? Do you have any literary goals for this year? ER: I have a couple of unfinished manuscripts I’m eager to get back to, both in different genres. I haven’t decided yet which one I’ll get to first! One’s a YA contemporary, and the other is more along the lines of speculative fiction, there just isn’t any sci-fi like there is in Sovereign. My goals for this year are pretty much to get those short stories out and then decide which book to get back to. The content is a passion project (it’s about music) but the other is more like my current work. Tough call! I think I am done with dystopian, but probably not done with post-apocalypse. Cheer, you and I met through Goodreads as well. We both love books. Can you tell us where your love for books and authors comes from, and how this has helped you with BOD? What are some of your additional goals as a reader? As a writer? Cheer: I think some people are born to be readers, while others grow into it. Me? Genetically predisposed to become a reader, I’m sure of it. If someone has a question about a book, I often have the answer. I love to give book recommendations and help other book lovers find the perfect book tailored to their interests, but I also really enjoy helping talented authors promote their work. As far as writing goes, I’m not a writer and I’m not sure I am meant to be. What I can tell you is that I have been making up characters and stories in my head since childhood and I still do it today, but isn’t that just daydreaming? A few years ago my kids begged me to write down a story I made up and I did. Yes, it is dystopian and 60k words later, I’m still at it. My kids love it, I hate it. Enough said. Along with all the hard work you both put into BOD, what other responsibilities do you hold, and how do you balance getting everything done? Balance getting everything done? Well, I have to bounce around a lot between the tasks that are most pressing. I go to bed every night with an unfinished to-do list that I estimate will never be empty. It’s a constant effort of re-prioritizing each day or each week. Cheer and I, along with yourself (Angie), are usually able to help each other with any BOD activities or needs that could become burdensome. Yay team work! 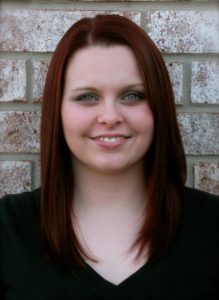 Cheer: Life is busy as a wife, mother of three teenagers, full-time dental hygienist and an active member of my church and community. I love my life and I love BOD. I try to keep a healthy balance, but there is not enough time in the day to do everything. Angie, you are a lifesaver, ER keeps me organized, and my family encourages me in all that I do. Oh and one more thing, I don’t require a lot of sleep. ER: #jealous — My life would be so much easier if I didn’t require much sleep!! I often think about pulling all nighters but I tucker out before too much progress has been made. Thank you for all your hard work. We love you and so appreciate what you guys do for all the authors and fans. What can we do to help BOD this next year be the best it can be? ER: You’re welcome! Just keep participating and making BOD such a fun place! Cheer: I really believe that BOD will continue to grow because of the support of amazing authors and kind, enthusiastic fans, so keep it up! I see great things in BOD’s future. ER: P.s. These ladies are amazing. I could never have done ANY of this without Cheer, and Angie brings such an incredible energy and joy to our team. Thank you both! “For a group full of doom-and-gloomers, we sure are a happy bunch!" Copyright © 2016 Band of Dystopian Authors & Fans. All Rights Reserved.